Many of us remember getting a little “help” with loose baby teeth when we were young. It wasn’t uncommon for strings to be tied to teeth and attached to other objects to make things move a tad quicker. Most children begin to lose their primary teeth around 5 or 6 years old, making room for the adult teeth growing behind them. 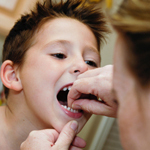 But when your child has a loose baby tooth, should you pull it? Generally, the answer is no. Parents that pull a tooth which may be less than ready to come out face the risk of damage to sensitive tissue, the possibility of infection, bleeding and pain. The best policy is patience and allowing your child to play with the tooth herself. Children are naturally curious about their loose tooth and will often wiggle it and play with it until it falls out on its own. Sometimes parents are afraid that their child might swallow a tooth that’s been ready to come out. If this happens, your child won’t choke and it’s very unlikely that problems can occur – except for possibly disappointing the tooth fairy! Previous post:How Can I Protect My Child’s Tooth Enamel? Here Are 5 Sure-Fire Steps.